Create your own world with a few strokes of a brush! Make a place for yourself in the art world with hyperreal masterpieces or abstract works of unsettling beauty. 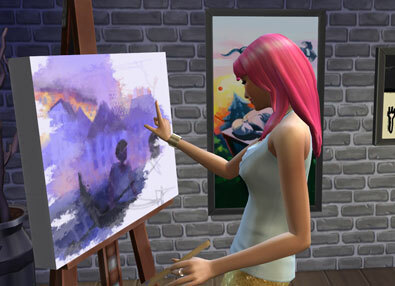 The Painter Careers is one of the most easiest jobs in The Sims 4. The required emotion and the daily task stays the same with every promotion with both branches. If you want to make serious money with the Painting Skill take the career as a painter, you will be able to sell your work to the Art Gallery for a lot more money than the other option ‘Sell to collector’. After level 6 you need to choose a branch, Master of the Real branch or the Patron of the Arts branch. Master of the Real branch pays less each week but you only have to work 2 days a week. Sims who choose the Patron of the Arts have to work 4 days a week. Almost every object you get as a reward for your promotion can enable an emotional aura so your Sims in the room can become inspired. This can really help to level up your Painting skill faster. If you hire an Agent when you reach level 5 in the Painter Career you can earn some more money. You can call your Agent to ask for a bonus or sell your art for more money. Create paintings on an easel. To become Inspired take a Thoughtful Shower before going to work. When you level up your skill you get more options to become inspired: Research Art Reference, Gather Inspiration and Critically Assess. You have Real Talent, and now others are starting to recognize it. Live your art, treat it with gravitas, and all the world shall follow. This branch rewards a great object: Deluxe All-Season Easel. You will have a higher chance to create masterpieces with this object. Build up your Logic Skill, you will need this when you want a promotion in this branch. If you can get your Sim focused you will have the option to paint Mathematical Diagrams which increases your Logic Skill. Your taste in art is impeccable, and you can make Great Things happen. Show off what you know as a Patron of the Arts. Rewards include the Rustic Dream Bed. The Patron of the Arts Branch requires to level up your Charisma skill. Try to be confident when leveling this skill for faster results. 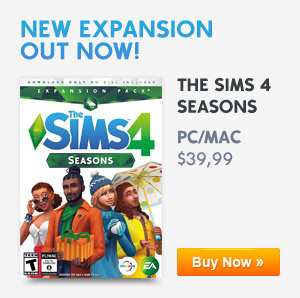 Previous ArticleThe Sims 4 Mac Release Date!Next ArticleFamily Trees are back in The Sims 4!